Spencer’s carries a wide selection of insect control. Listed are just a few of our preferred products. 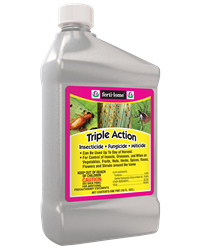 Triple Action is effective on aphids, spider mite, leaf miner, beetles, and more. It is safe for use on and around edibles, even up to the day of harvest. It is also effective on an array of fungal diseases. This is one of our favorite products and a best seller! 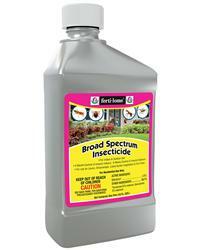 Broad Spectrum Insecticide is safe for use on lawns, trees, roses, and edibles. It controls mosquitoes, ticks, ants, crickets, and more. A great product for any garden! 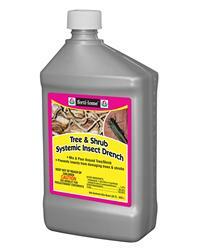 Tree & Shrub Systemic Insect Drench is an absolute tree-saver! Simply measure the tree trunk, mix with water, and pour around the base of the tree. You’ll protect your tree against borers (including emerald ash borers), scale, pine tip moth larvae, leafminers, and more. Do it yourself and save potentially hundreds of dollars compared to tree companies! 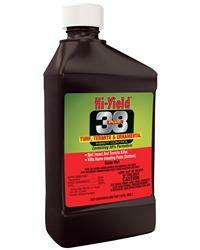 Hi-Yield 38 Plus Turf, Termite & Ornamental Insect Control works in the lawn and around the foundation of the home to prevent invasion of spiders, termites, beetles, and more.